Once a niche athletic supplement, branched chain amino acids (BCAA) have exploded in popularity as a means to improve muscle retention, fat loss, endurance, and focus during workouts. Today there are hundreds of different BCAAs on the market many of which include stimulants, adaptogens, micronutrients, and extracts to make them stand out from the crowd. It’s not uncommon to see BCAAs packaged with other supplements like caffeine, glutamine, taurine, beta alanine, citrulline malate, and other ingredients that may also benefit workout performance. In this article, we’ve taken the BCAAs, the extra ingredients, the price, and the taste into account when deciding the best brand depending on your goal. They’re not necessary if you have a sufficient protein intake, but they’re often used as supplements to boost muscle protein synthesis between meals or to enhance performance and retain muscle when exercising on an empty stomach. It can be hard to know which is the best BCAA. That’s why we did the work for you. Of course, there are a lot of different criteria by which people judge the best anything. So we tried dozens and dozens of them, from the biggest brands to the up and comers, to land on our favorites in the following nine categories. With a higher than usual dose and a wide variety of tasty flavors, SciVation deserves its reputation as one of the best BCAA products, period. BCAA Complex 2200 has added vitamins that may improve recovery and muscle retention. This tasty BCAA supplement contains 44 servings and over 8g of BCAAs per serving, offering serious value for money. This supplement delivers over 5 grams of 2:1:1 ratio BCAAs to fuel every type of workout. This BCAA delivers a 2:1:1 ratio along with 11 essential amino acids. This BCAA delivers over 6 grams of essential amino acids and has extended release leucine. Keep reading for some more detailed breakdowns of our top choices per category, as well as picks for some other common categories below! You might have heard that amino acids are the building blocks of protein, but they’re not all alike. The three proteinogenic branched chain amino acids, meaning BCAAs that are incorporated into proteins during translation, are leucine, isoleucine, and valine. Some evidence suggests that supplementing with pure BCAAs can have a positive effect on workouts. They may promote muscle protein synthesis, increase muscle growth over time, and by preventing a serum decline in BCAAs (which occurs during exercise), they can help prevent fatigue. They’ve even been linked to increased fat loss and quicker reaction times. 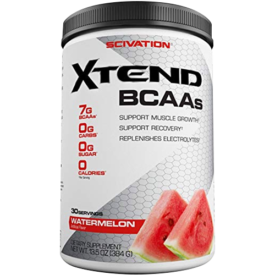 Scivation Xtend was our favorite all-around BCAA supplement. At 11 cents per gram of BCAA it’s one of the most inexpensive BCAAs you can find, but it also delivers lots of Vitamin B6 (which may help with muscle retention), electrolytes, glutamine, and citrulline malate, which might help you crank out a few more reps. It’s also available in over a dozen different flavors and if you don’t like artificial sweeteners, there’s even a “natural” option. Bonus: it has no caffeine or stimulants, so it can be taken any time of day. Optimum Nutrition Gold Standard BCAA was our second favorite overall. It has a dose of Vitamin C, which may reduce cellular damage caused by exercise, and a decent serving of magnesium, sodium, and potassium. The real highlight is the rhodiola extract, an adaptogenic root that can reduce stress and improve alertness and focus, but there’s also baker’s yeast, which is strongly linked to improved immunity. 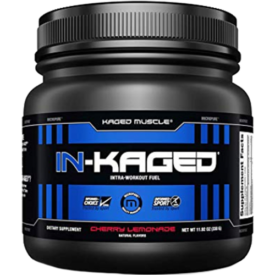 KAGED MUSCLE IN-KAGED Intra-Workout Fuel was our third favorite. This is especially great as a workout supplement since it contains a hit of serious hit of caffeine and l-tyrosine along with some taurine, which may reduce jitteriness associated with caffeine. But at 24 cents per gram of BCAAs, it’s about twice as expensive as Scivation and some other popular brands. Betancourt Plus Series BCAA came out on top as the best BCAA for men. This is actually a great all-rounder as far as BCAAs go, but we found it particularly useful to men because it contains a very high amount of zinc. One serving contains almost 150 percent of your daily intake, and adequate zinc intake has been linked to optimal testosterone production. It also has a large amount of Vitamin B6 and B12, too. BSN Amino X was our second choice for men. One of the first things we liked about it is that it’s rather high in sodium, which is an important nutrient to replace when you’ve been training hard. But the best feature for men is that one . scoop contains 125 percent of the RDI of Vitamin D, which is linked to healthy testosterone levels. Optimum Nutrition Gold Standard BCAA is also a potentially great BCAA for men. We already liked it because of the stress-busing rhodiola and the immunity-boosting baker’s yeast, but it’s especially good for men because it has more magnesium than any other branched chain amino acid supplement we tried. In addition to improving recovery and sleep, and magnesium is linked to healthy testosterone levels. Ideallean BCAAs for Women came in first. Ideallean is the only BCAA we’ve seen that’s aimed squarely at female athletes. According to their website, the big draw the product has for women is its focus on fat loss, and indeed it contains a wide variety of ingredients, from evodiamine extract to green tea catechins, that have been linked to fat loss in some studies. It’s also very high in certain B-vitamins that are important for women, particularly during childbearing years. 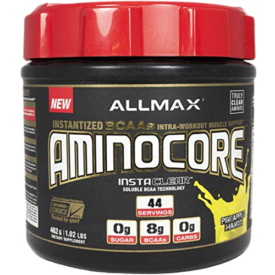 Allmax Aminocore was our second favorite for this category. While not quite as potent in this regard as Ideallean, Aminocore is remarkably high in B-vitamins and contains over 100 percent of the recommended daily intake of Vitamins B3, B6, B9, and B12 in each scoop. Also of note, it has a nice, large serving size of over 8 grams of BCAAs, but it’s just 5 calories per scoop. Ghost Amino is another good pick for women. Ghost has a lot of unusual ingredients, perhaps more than any of the other branched chain amino acid supplements we reviewed and while it’s free from B-vitamins, it was the highest in calcium of all the BCAAs we looked at. Calcium is a mineral that’s especially important for women as they have a greater risk of bone loss later in life. 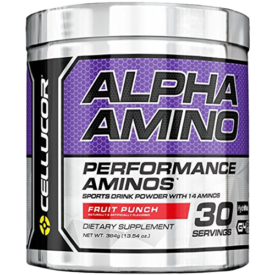 Cellucor Alpha Amino is our top choice for people on a ketogenic diet. It has no calories so there’s little risk of it kicking you out of ketosis, and it’s also pretty high in magnesium, sodium, and potassium, minerals that are usually recommended as important supplements for people following the high fat diet. Optimum Nutrition Pro BCAA was our second pick for ketogenic diets, even though it has 1 gram of carbs per serving. This is because with 100 milligrams per serving, it’s quite high in sodium. Since the body excretes sodium and water when on a low carb diet, it may be smart to supplement. Pro BCAA also has a considerable 5 grams of glutamine, which could help glucose production. Ghost Amino is another good pick for keto folks. It does have two grams of carbohydrate per serving but it’s pretty high in sodium and potassium, plus it has one gram of taurine per scoop. Taurine may amplify the effect of insulin, so it’s sometimes recommended on low carb diets. KAGED MUSCLE IN-KAGED Intra-Workout Fuel was our favorite for functional fitness style workouts (such as CrossFit workouts). This is because it has a good hit of caffeine, plus there’s taurine and tyrosine to help with jitteriness and improve cognition and focus. There’s also beta alanine and l-citrulline, which have been linked to endurance. MusclePharm 3:1:2 is another good pick for lengthy, intense workouts. This is because unlike most BCAA supplements it contains a relatively high amount of valine, which is the branched chain amino acid most closely linked with endurance and focus. Evlution Nutrition’s BCAA Energy is also a good pre-workout BCAA. It has plenty of caffeine, taurine, and beta alanine (though less than IN-KAGED does) and it has some extra Vitamin C, which may reduce cellular damage associated with exercise. Still Looking for the Best BCAA Supplement? We understand not all athletes and exercisers will find brands that perfectly fit their needs from our picks above. So we’ve gone into even more detail for our favorites in some other common and popular categories below. Which BCAA supplement is right for things like weight loss and value? Disclaimer: Please note that none of these products describe themselves as weight loss supplements and should not be taken as such. Please consult with a medical professional before beginning any weight loss protocol. 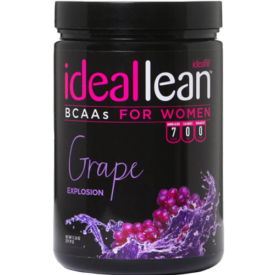 Ideallean BCAAs for Women had the most dedicated weight loss ingredients. This includes evodiamine, a berry extract that’s been linked to fat loss in rodent studies; green tea extract; and CLA, a type of fat that may help with weight management. Note that these ingredients are present in relatively small amounts, but there may be some effect. Ghost Amino was another good pick. It contains a few unusual ingredients that may help with weight loss like Alpha-GPC, which is linked to healthy production of growth hormone, and 5-HTP, which may affect appetite control. Optimum Nutrition Gold Standard BCAA was our third favorite for weight loss. We picked it because it contains beta glucans from baker’s yeast, which are strongly linked to improved immunity. Avoiding sickness is an extremely underrated component of effective fat loss and one that doesn’t get enough attention. This tasty BCAA supplement contains 44 servings and over 8g of BCAAs to help muscles recover. Allmax Aminocore was our choice for the best value branched chain amino acid supplement. It’s about 8.8 cents per gram of BCAAs, plus it delivers a lot of B-vitamins and it has nice, big serving size of 8 grams of BCAAs per scoop. MRM BCAA+G Reload is another inexpensive, high quality option. It’s 9.6 cents per gram of BCAAs and it has a hefty dose of Vitamin B6, beta alanine, and glutamine. It’s also naturally sweetened with stevia and monkfruit — which means it doesn’t taste as good as some of its competitors but it’s free from a lot of chemicals. Scivation Xtend is our third favorite for the money. Roughly 11 cents per gram of BCAA makes this on par with a lot of popular BCAAs but with extra glutamine, citrulline malate, and Vitamin B6, it’s our favorite in that price range. 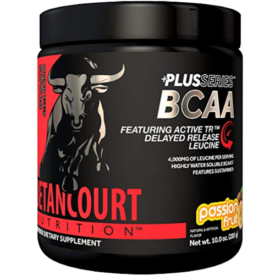 Betancourt Plus Series BCAA was our favorite for stimulating muscle growth. This isn’t just because it contains a lot of zinc, which is linked to healthy testosterone production. It also contains not one, but two kinds of leucine, the amino acid that’s most closely linked with muscle protein synthesis. Reign BCAA Elite+ was our third choice for muscle growth. It has the second highest amount of citrulline malate of all the BCAAs we tried and it also contains betaine anhydrous, which may improve power output. We also liked that it contained black pepper extract, which can improve the absorption of the nutrients. A supplement with over 400 BCAA capsules containing 2.2 grams of BCAAs per serving. 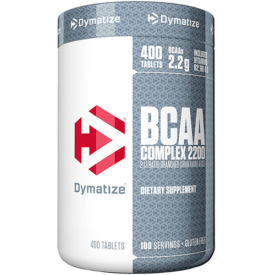 Dymatize Nutrition BCAA Complex 2200 were our favorite branched chain amino acid pills. At 13 cents per gram of BCAA they’re not that cheap, but they come with a dose of Vitamin C, which can reduce cellular damage during exercise, and Vitamin B6, which can help with muscle retention. There’s also a host of ingredients, like crospovidone and croscarmellose, that help with product to absorb as efficiently as possible. MyProtein BCAA 4:1:1 was our second favorite pill. These deliver about 1.5 grams of branched chain amino acids per pill and while there aren’t a lot of extra ingredients to improve your workout, there’s still 70 percent of the recommended daily intake of Vitamin B6 per serving. This product also costs 9.1 cents per gram of BCAA, so it’s cheaper than Dymatize. Optimum Nutrition 1000 BCAA Capsules was our third favorite BCAA pill. It’s the cheapest of these three options at just 7.8 cents per gram of BCAA — the cheapest of any source of BCAAs that we’ve tried — but it pretty much only contains the three branched chain amino acids themselves. Note that it’s also packaged in gelatin caplets made from beef and pork, so avoid these if you keep kosher, halal, vegan, etc. We tried dozens of branched chain amino acid supplements to land on this list, weighing price, taste, ingredients, and effectiveness. Plenty of people have different ideas as to what constitutes a “quality” supplement, but we think we’ve put together the best darn guide to picking a BCAA on the internet. For more information on each of the products, just make sure to click through to the full review. Enjoy!